This guide will provide users with information on applying, studying, and preparing for the Georgia Bar Exam. 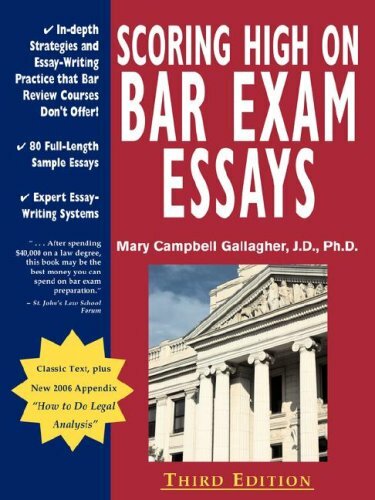 Most states' bar exams have an essay portion. Georiga has four essay questions prepared and graded by the Board of Bar Examiners. Applicants will be provided 45 minutes to answer each question. Answers to the essay part of the examination and the Multistate Performance Test shall be graded by or under the direction of the Board, which shall pass upon the merits of papers submitted in answer to questions on those parts of the bar examination. Assume that the questions arise under the laws of Georgia, unless otherwise indicated. Each answer should show: an understanding of the facts; a recognition of the issues involved; the principles of law applicable; and the reasoning by which you arrived at your conclusions. The value of an answer depends not so much upon the correctness of the conclusions as upon the presence and quality of the elements above-mentioned. Clearness and conciseness will count but make your answers complete. Do not volunteer irrelevant or immaterial information. Demonstrate not merely your memory, but your ability to think and analyze the issues. Read each question carefully and understand it before answering. For exams February 2000 to July 2012 there are 4 questions, each with a corresponding page of sample answers.